Jetsün Taranatha (Tib. རྗེ་བཙུན་ཏཱ་ར་ནཱ་ཐ་, Wyl. rje btsun tA ra nA tha) or Kunga Nyingpo (Tib. ཀུན་དགའ་སྙིང་པོ་, Wyl. kun dga' snying po) (1575-1634) was a great accomplished master of the Jonang and Shangpa Kagyü traditions of Tibetan Buddhism. Though famed in Tibet as the author of many treatises on tantra and philosophy, he is especially known in the West for his masterly History of Buddhism in India. The name, Taranatha, which is of Indian origin, was given to him at the age of 20 in a dream by an Indian yogi, and exemplifies his strong connection with India, “the Land of the Aryas”. He learned effortlessly some of its languages including Sanskrit. He was the uncle of the Fifth Dalai Lama. He wrote his most famous work, History of Buddhism in India, in 1608. 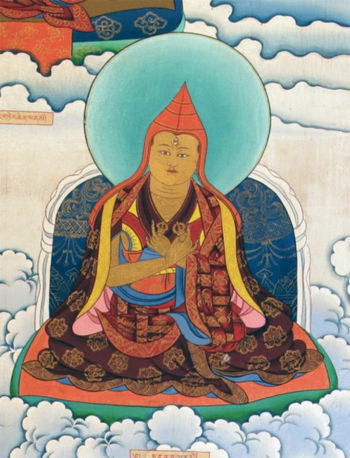 The 5th Dalai Lama recognized the son of a Khalkha Mongol Khan as the reincarnation of Jetsün Tarnatha. This boy and his successive incarnations became the Jetsün Dampa Hutuktu (Tib. རྗེ་བཙུན་དམ་པ་ཧུ་ཐུག་ཏུ་, Wyl. rje btsun dam pa hu thug tu), the spiritual heads of the Gelug lineage in Mongolia. Jo Nang Taranatha, The Origin of the Tara Tantra, translated and edited by David Templeman, Library of Tibetan Works and Archives, first published in 1981, revised edition 1995. This page was last edited on 5 June 2018, at 17:33.